Koji Hirata encountered the bandoneon, a type of concertina, at the young age of 13. While it’s common for a teenager to take up a musical instrument, Hirata showed an unusually high level of commitment when, at 16, he took a solo trip to Argentina to learn it. The following summer he spent another month in Buenos Aires studying under Lazzari, who was an expert in classical rhythmic tango, as well as Nestor Marconi, who taught Hirata the modern style. He supplemented his musical foreign exchanges with music studies at Senzoku Gakuen college in Kawasaki and the tutelage of Japanese bandoneonists Akira Okamoto and Yuzo Saito. In 2007, he went to Buenos Aires again, where he became the first Japanese bandoneonist to be accepted in the municipal Tango Orchestra School. During his stay there, he performed at La Ventana, a restaurant that is renowned for its tango shows. Hirata was there “every night for six months,” performing in a band led by his teacher, Lazzari. The experience taught Hirata about the sophistication of tango and the importance of Spanish. 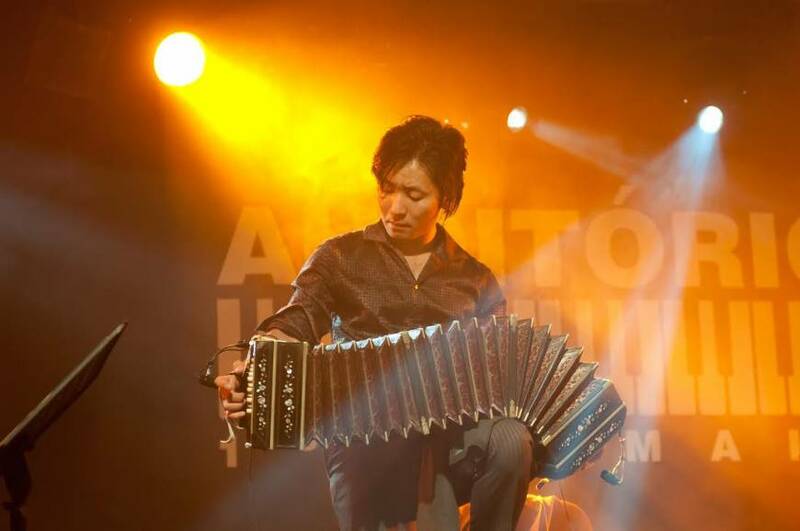 Before long, Hirata became a member of the tango ensemble Cambatango, which was invited to the world music festival Festa de Avante! in Portugal in 2010 as the official representative of the Argentine government. “At first people thought I was Argentine of Japanese descent, as it is not that common for the government to sponsor a performer who is not Argentine,” Hirata recalls with a laugh. “But my dear bandmates strongly insisted that I was an indispensable member of Cambatango.” This paved the way for Hirata’s Portugal trip and another tour with the band to New York in 2014. In recent years, Hirata has mainly performed in Japan playing with his all-Japanese ensemble, the Koji Hirata Tango Quartato. The four-piece performs classical tango, contemporary numbers and Hirata’s own original pieces. For his upcoming Premium Tango Concert, Hirata says he and his quartet — consisting of pianist Kenji Kanemasu, violinist Akiko Nasu and contrabassist Motoki Warashina — will perform popular tango pieces and what Hirata refers to as overlooked masterpieces, such as “Self-Portrait” by Astor Piazzolla and “Graceful Ghost Rag” by William Bolcom. They will then come together to create a particular tango groove that Hirata calls “the true thrill” of the genre. The Premium Tango Concert takes place at Yokohama Minato Mirai Hall’s Small Hall on Sept. 6 (1:30 p.m. start; ¥3,000-¥4,000). For more information, call 03-6431-8186 or visit www.hiratakoji.com. Copyright ©Koji Hirata WEB All Rights Reserved.